Want to see my Kstars/Ekos/Stellarmate session? I recorded a (cloudy) test session to test ST4 and dome slaving for Jarem to see. Because it was just a test I didn't expect to share it and there is no narration. Next time I'll narrate and do a little tour. Anyway if you want to see it (rather boring unless you're looking to get into the software) you can view it here. And while ST4 did work fairly well - pulse did not and the mount takes off during calibration steps. I went back to ST4... but really was too cloudy for me to see stars visually... but luckily longer exposures still picked up some so I could test. Last edit: 1 week 6 days ago by Ron Kramer. Replied by wvreeven on topic Want to see my Kstars/Ekos/Stellarmate session? Replied by Ron Kramer on topic Want to see my Kstars/Ekos/Stellarmate session? I'll do one for public consumption on a clear night. And wasn't like it was a fun target - just happened to be a cluster near the meridian. But it is cool to kinda see the software work. Last edit: 2 weeks 8 hours ago by Ron Kramer. I’ll admit I didn’t watch it when I wrote that reply but I skimmed through it just now. I was excited to see your dome move though I expected the telescope and the dome to move together. Will that be possible in the future? It does now. I disabled the dome slave at start up . And I think because of that it didn't follow the scope. normally it does. I'm new to the software so I don't know all the quirks yet. so he may tweak that. (since he just rewrote the driver). I'm also in the house 100 yards from the dome. Here's an example of it tracking with the shutter. Replied by knro on topic Want to see my Kstars/Ekos/Stellarmate session? 1. 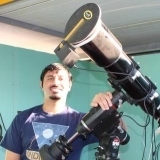 Use the remote solver on StellarMate instead of Online. You just need to select "Astrometry" driver as one of the Auxiliary drivers. This would probably be faster than online. 2. Minimum pulse should probably remain at 100, any value under that would make too many smaller pulses that might actually make guiding worse than better. 3. Maximum pulse should be keep at one value, I see you keep changing it. 4. Binning 2x2 will help resolve the star better. 5. The guiding rate value is for the MOUNT guiding rate.. if you change it, nothing changes really. The only thing that happens is that it suggests the recommended proportional gain to use. It's a pointing/slaving test after I installed kstars/ekos and entered in my slaving requirement settings. okay done. I don't have to install any FOV files? Hoping it's faster! I typically run the min very low on PHD (lower than recommended for most mounts) Low setting in PHD for me has to do with seeing. If I see oscillation I know it's chasing seeing and I increase it. But I'll go back up to 100 and check it again now that ST4 works. (thanks!) will do. I agree - but I get SLITS (see other post about guiding). If think you'll see that in the video. I had 2x2 and when I looked I had SLITS. the brighter the star the longer the slit. You can see I almost clicked one - or did and tried then went to 1x1 to get a "STAR" instead of a slit. ??? 5. The guiding rate value is for the MOUNT guiding rate.. if you change it, nothing changes really. The only thing that happens is that it <strong>suggests</strong> the <em>recommended</em> proportional gain to use.